In 2007 Catawba County in western North Carolina used tax incentives to persuade Apple, Inc. to build a data center in the town of Maiden (current population 3269) where Apple subsequently spent $1 billion building a 500,000 sq. foot data center. During construction of the center much speculation circulated in the media as to the purpose of the building. At Apple’s 2011 World Wide Developer Conference in San Francisco all speculation was laid to rest when the iCloud service was announced to the public. This chapter is intended to provide an overview of iCloud and to walk through steps involved in preparing an iOS 5 iPad application to utilize the services of iCloud. From the perspective of the average iPad owner, iCloud represents a vast remote storage service onto which device based data may be backed up and music stored for subsequent streaming to multiple iCloud supported platforms and devices. By default each registered user account gets 5GB of storage space for free and the option to purchase more as needed (stored music does not count towards the storage count). From the perspective of the iOS application developer, on the other hand, iCloud represents a set of programming interfaces and SDK classes that facilitate the storage of files and data on iCloud servers hosted at Apple’s data centers (of which the Maiden, NC facility is just the first of many) from within an iPhone or iPad application. The current version of the iOS SDK provides support for two types of iCloud based storage, namely iCloud Document Storage and iCloud Key-Value Data Storage. iCloud document storage allows data files and documents on the user’s device to be stored on iCloud. Once stored, these files may be subsequently retrieved from iCloud storage via any supported device or platform using the owner’s iCloud account details. The iCloud key-value storage service allows small amounts of data packaged in key/value format to be stored in the cloud. This service is intended to provide a way for the same application to synchronize user settings and status when installed on multiple devices. A user might, for example, have the same news application installed on both an iPhone and an iPad. The news application would use iCloud key-value storage to synchronize the reader’s current page and paragraph, thereby allowing the user to switch between devices and resume the reading from the same text position. Implementing iCloud based storage within an iOS 5 application is not simply a case of making appropriate calls to the SDK iCloud APIs. In order to access iCloud services the application must be associated with an application ID and a corresponding provisioning profile configured to enable iCloud access. In addition, the application itself must also be configured with specific entitlements to enable one or both of the two iCloud storage methods outlined in the preceding section of this chapter. Finally, it is also important to note that it is not possible to test iCloud functionality in the iOS Simulator. The application must, therefore, be installed on a physical iOS device. Clearly, iPad developers who are not yet members of the iOS Developer Program will need to enroll before implementing any iCloud functionality. Details on enrolling in this program are outlined in the Joining the Apple iOS Developer Program chapter of this book. The remainder of this chapter will cover the steps necessary to create an iCloud enabled provisioning profile and to configure the necessary entitlements for both document and key/value based storage. In order to create an iCloud enabled App ID the first step is to log into the iOS Developer Program Member Center. Once logged in, select the link to the iOS Provisioning Portal and click on the App IDs link. Create a new App ID by clicking on the New App ID button. Having creating an iCloud enabled App ID the next step is to incorporate that ID into a provisioning profile. Remaining in the iOS Provisioning Portal, click on the Provision link and, in the resulting screen, click on the New Profile button. Within the Create New iOS Development Provisioning Profile screen, name the new profile and select the development certificate to be used for the profile. Using the App ID menu, select the App ID created in the previous section followed by the devices on which the app is to be permitted to run before clicking on the Submit button. If the new profile is listed as Pending in the main Provisioning screen, simply use the browser reload button to refresh the page. Once the profile is listed as active, click on the Download button to save the .mobileprovision file to your local system. Once downloaded, drag and drop the file onto the Xcode icon in the desktop dock to install it into the provisioning profiles library. At this point the Xcode Organizer window should appear. Connect your iPad to the system so that it is listed under DEVICES in the left hand panel of the Organizer window. Select Provisioning Profiles from beneath the LIBRARY heading and drag and drop the new profile onto the Provisioning Profiles entry located beneath the iPad device under the DEVICES heading. Once completed, the provisioning profile is installed and ready to be used when developing an application. Any applications that intend to use iCloud storage in any way must obtain entitlements appropriate to the iCloud features to be used. These entitlements are placed into an entitlements file that is included in the Xcode project and built into the application at compile time. If the application is intended to make use of iCloud document storage then the entitlements file must include a request for the com.apple.developer.ubiquity-container-identifiers entitlement. Similarly, if the key-value store is to be used then the com.apple.developer.ubiquity-kvstore-identifier entitlement must be included. Applications that require both forms of iCloud storage must include both entitlements. The entitlements file is an XML file in which the requests are stored in a key-value format. The keys are the entitlement identifiers outlined above and the values are represented by one or more container identifiers comprised of the developer’s ID and a custom string that uniquely identifies the application (the corresponding application’s App ID is generally recommended, though not mandatory, for this value). 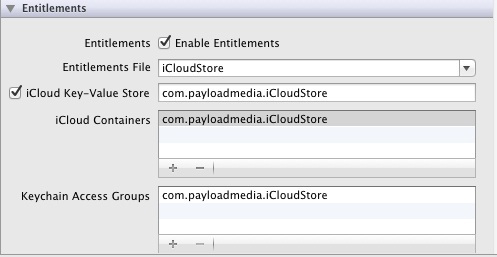 The entitlements file may be created either manually or automatically from within the Xcode environment. To modify a value simply double click on the corresponding field to enter edit mode. iCloud brings cloud based storage and application data synchronization to iOS 5 based applications. Before an application can take advantage of iCloud it must first be provisioned with an iCloud enabled profile and built against an appropriately configured entitlements file.